Two years ago Open Arms Housing began a discussion of opening their second permanent supportive housing residence in Trinidad. The project was well received and TNA provided a letter of support. 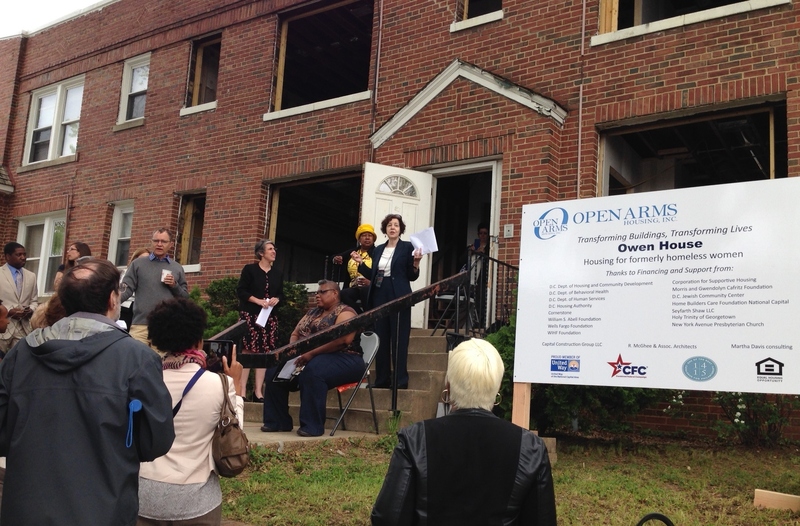 On Thursday, April 30th, TNA joined Open Arms for the ground-breaking ceremony for Owen House at 1256 Owen Pl NE. 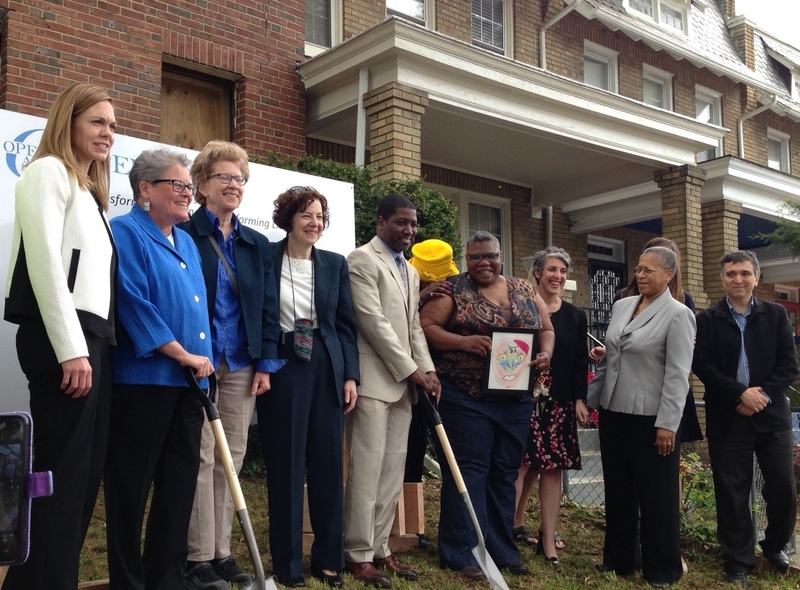 Owen House will provide permanent housing for four homeless women with mental health issues and physical disabilities. Open Arms’ other residence, The Dunbar, was the first in Washington, DC to implement the “Housing First’’ approach to assisting homeless women in a single site building. The Dunbar Building has had a phenomenal success rate, with 95 percent of its residents remaining in housing since residing at the facility. Owen House will have large one-bedroom apartments for each resident. Funding for the new facility comes from private and public entities including: the DC Department of Housing and Community Development, the DC Department of Behavioral Health, the DC Department of Human Services, the DC Housing Authority, The Corporation for Supportive Housing, Cornerstone, Inc., and the Morris and Gwendolyn Cafritz Foundation. In-kind services have been provided by Seyfarth Shaw LLC, The Behrend Builders of the DC Jewish Community Center and the Homebuilders Care Foundation of the National Capital Area. ASL/English Interpretation provided by Access Interpreting, Inc. There are two new applications submitted and pending hearings by the Board of Zoning Adjustment (BZA). In previous posts on BZA cases, the owners have asked for relief from zoning requirements citing hardship in meeting requirements of permitted use. These two cases are special exceptions. A special exception is a permitted use under the zoning ordinance so long as the conditions for its availability stated in the ordinance are met and the proposed use does not seriously infringe the health, safety and welfare of the community. The first is BZA Case 18995 for an expansion to an existing carriage house/garage in the alley between Florida Ave and Morse St (1254 Florida Ave). The current one-story structure will be converted to a legal dwelling unit with the parking spaces in the garage maintained. The house and garage will be connected by a covered walkway. A special exception is being sought as the existing house is non-conforming for lot occupancy (40% allowed by right as the house in semi-detached). The addition will increase lot occupancy to 4.7% over the allowed lot occupancy. The rear setback will no longer meet the required minimum once the carriage house is converted to a legal dwelling unit, even though the footprint will not change at the rear of the property. The changes should have minimal impact on light, air access, and privacy of neighboring houses given the width of the alley and yard sizes. No impact on parking is expected as the carriage house will retain the two parking spaces it currently contains (one for each dwelling unit). The hearing date for the carriage house expansion and related lot occupancy has been set for May 12, 2015 to review the special exception requested. The second case is BZA Case 19004 for the exceptions to parking needed for the building at the corner of Bladensburg Rd and Oates St. This building will eventually house DaVita Dialysis. Both DaVita Dialysis and the property owners have presented to the ANC (Single Member District and full ANC) in the past to seek certificate of need to move the dialysis clinic from Capitol Hill to Bladensburg Road or for the need for parking exception. The most recent presentation was to the SMD on March 12, 2015 to discuss the request for parking exception. 1) To reduce the number of parking spaces from 25 required to 20. 2) Exception is also requested as the parking is not on the same lot as the clinic. Instead it will on the adjacent lot and separated by an alleyway. 3) The alleyway is 20 ft. wide and the regulations stipulate a 10 ft. separation between a parking lot and a medical office. Exception will be needed for the additional 10 ft. width in the alley. No date has been set for the hearing on the parking exceptions but that will be communicated when available. Documents and architectural drawings for both of these special exception cases can be found on the BZA website. To search for specific cases going before BZA, go to The Interactive Zoning Information System website: http://app.dcoz.dc.gov/content/search/Search.aspx. Case numbers for these cases are 19004 and 18995. If you do not know a specific case number or wish to see what other cases are active, you can search by ANC area (click the ANC box in the “Search by” line and enter 5D in the “Search Term” line).